Is it tricky Finding the Right Sloping Lot House Plan? Our Custom Home Design Starter Pack is a Practical, Efficient & Economical way to Find the Perfect Home Design Solution. Looking for Perfect Home Design for any Budget? Plans belong to a particular Builder, so the both the plan and builder have to be right for you.Then the build price has to be right too. That is a tall order. The best builders don't always have a process to design your home. Custom home design is a difficult drawn out process. This is not very helpful. Most Custom Home Designs Cost too Much to build. Building Buddy provides a low-cost way to find the best design that is practical, efficient and economical. Our Custom Design & Build Package cost-plans your home so you can build it for a no-nonsense price. Nobody understand Home Design & Build like we do. Building Buddy is a low-cost alternative to an expensive architecturally designed home. We focus on Builders that can deliver a quality trade finish for a reasonable price because of their experience as tradesmen. By providing the necessary support support system for these small builders, we are able to keep their overhead low, They can keep their focus on delivering quality work on-site. Don't rely on project home supervisors who often have never produced the quality you deserve. With 30 years experience designing homes under our belt, we have found, that the most cost-effective way to design a home on a sloping site was to approach the task with an outcome in mind. That means you have to plan with all the factors in mind and work to achieve optimum results so that you are getting the most benefit for your money. If you accept the inevitability of site cost, you can use that to create value by incorporating fetaures such as a multi-level home that creates ambience with high ceilings and other design features. With an eye on the final result, the floor layout, design style, and building techniques will complement one another. Each of these design elements contributes to the overall solution, so the neccessary site costs is not wasted, but utilized to create value. As a composition, a sloping lot home design can celebrate the finer attributes of your property, and enhance its value as a whole. So what is generally considered to be a negative situation, can become a positive feature of your overall home design outcome. Thalk to us and take advantage of our service to quickly examine your options. Think of how much more effectively you can manage the design of your home if you knew what the various options would cost? Imagine all the options and opportunities this opens up? An extra room, more deck space … those features and inclusions you always wanted, but never believed were possible, are now easy to match with your budget. 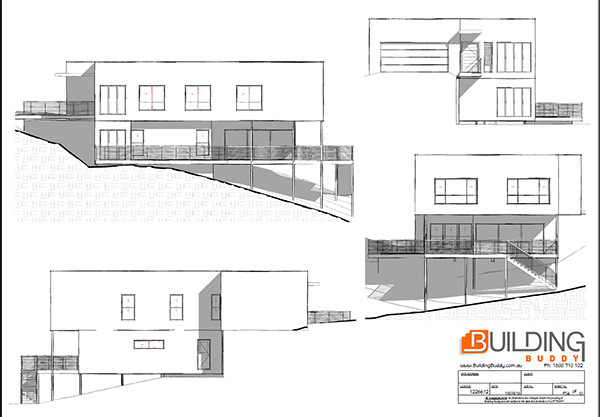 A Sloping Lot House Plan Design Process That Really Works. We have never thought of our Sloping Lot House Plans as a 'standard' set of plans, so didn't have a specific collection available for download. 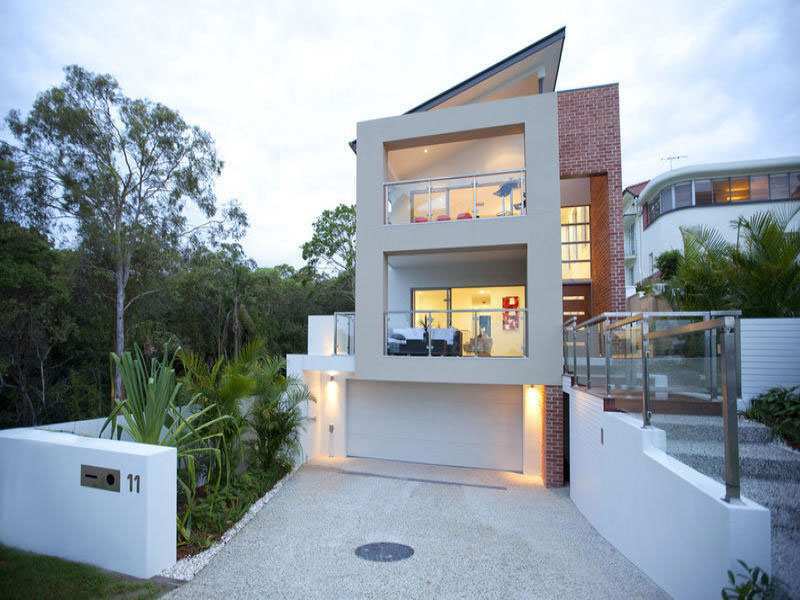 But many of our custom home designs involve steep or sloping sites. This design collection is therefore meant to prod and trigger feedback. To encourage a spirit of creative adventure and to spark ideas. We hope that will be a fruitful and rewarding experience for those embarking on the adventure of creating their very own, personalised home. We want to be right there, on that journey with you, always providing the assistance and tools to help bring your imagination to reality. By downloading this collection, you automatically become entitled to access the complete collection, including the many free tools available to help you visualise and customise your dream home. Home Designs on Irregular shaped blocks that are also steep. Split level House Plans on Small and narrow blocks as well a big acreage blocks of land. Homes Designs that Cling to the Side of a Hill. Traditional Highset Homes built on Posts and bearers.